So, you are choosing the best canister filter? The most important fact you should know is that their manufacturers quite often play hanky-panky with you when indicating the amount of water being pumped by a filter per hour. So, in this respect you should buy a bit oversized filter. And this is it, now you may skip the rest of the article since below there are only boring details and comparisons, characteristics and IMHO as for studied canister filters. In general, I’ve listed all worthy filter models and if there are others, then they are made by some noname brands, or they are some rare models, to describe which I haven’t found sufficient amount of information. 2 FAQ – How to pick a canister filter? 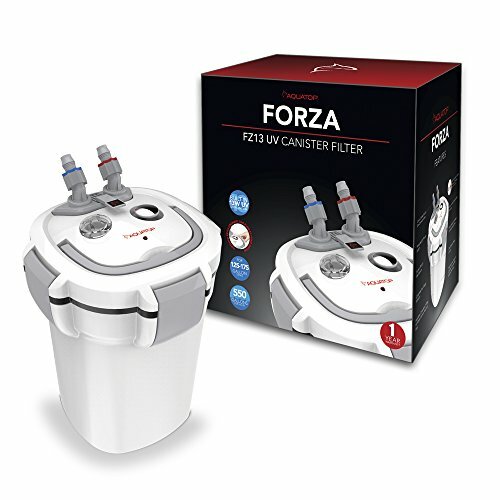 4 How to find optimal canister filter? 5 So what is it exactly – biological, mechanical and chemical filtration? FAQ – How to pick a canister filter? The most important advise – don’t try to find an ideal filter. If you read canister filters reviews at Amazon.com or in forums – they’ll drive you crazy. One and the same filter is being blessed and cursed at the same time. The story is the same for all filters without any exception. The rule here is simple – the cheaper the filter is, the less you should expect from it. However, you may get the short straw with an expensive one and it may be a rejected product. Though, the expensive ones usually have a good warranty. You should buy double or triple oversized canister filter. So, if you have 50 gallons tank, then buy a filter optimized for 100-150 gallons. There is no filter, that makes water renews unnecessary! Regular water renew is a must with or without a filter. Which type of filter is best for aquarium? If you doubt which filter to buy – keep in mind, that canister filters are always better. They are multi-fold efficient, since apart from mechanical water purification they provide biological and chemical filtration. What does it mean? There is a detailed guide at the end of the article which I recommend you to read to get the answers. Are canister filters good for saltwater tanks? Sure, most of them. The wider the hoses are the more efficient the filter is. Its pumping rate is defined by the width of the narrowest section of the hose. Canister filter requires the simplest fillers in small amounts. You’d like to improve water filtration efficiency sufficiently? Then buy the fillers. Due to these expenses cheap filters become not as cheap as they seem. There are no multipurpose filters. You’ll have to select a filter for each task you have in mind. For example, for a tank with cichlids and for a planted tank you’ll need completely different filters. If you doubt as for the filter pumping rate – always buy the more powerful one. A powerful pump may be needless only in very small tanks. For successful operation a filter should be placed below the water level and usually it is placed under the tank. Avoid the hose kinks! This is crucially important since when in service these kinks may get clogged and lead to pressure increase in the system and to further hose detachment from the filter. Sealing rubber o rings should be greased with a special silicone or vaselene and then they serve longer. Pay attention to the filter clamps. They should at least look sustainable. Slimpsy looking clamps are the reason for the filter leakages. The way the hoses are fixed to the filter intake and output pipes. Fixation should be sustainable by means of hold-down nuts otherwise the hose can just jump out of the pipe, since it becomes more flexible in time. Some filters have a trouble spot – so called adaptor. It has to detach the hoses fast from the filter and simultaneously block the water flow. It’s a quite useful device, which largely eases the filter shut down for maintenance. But in some models adaptor starts leaking because of its o rings wear or some mechanical damage. Pay attention to the pump impeller axle: it may be a metal one (more cheap) and a ceramic one (more expensive, which is good for marine tanks). The ceramic axle is considered to be more wear proof and less noisy, however it’s rather fragile and expensive in case of replacement. It is a good practice to take a look inside the filter. You should be interested in types of filtering elements and their availability on the market. The majority of filters come already fully equipped with everything that is necessary: sponges of different porosity, ceramic pellets, bio-balls, absorbent carbon. However, some filters are equipped only with sponges. Early models of «Eheim Classic» filters are sold without any filtering media at all (only sponges for fine and coarse water filtration). All of abovementioned stuff surely can be bought, though it is still more comfortable to use a complete product. 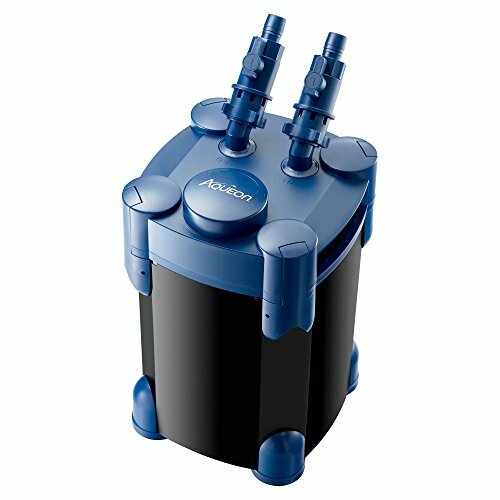 The company has its best-in-class filter, a powerful filter FX-6 for tanks up to 400 gallons (filter output 563 GPH, 41 Watt). This filter is made for tanks with large amounts of organics that has to be removed mechanically. These are large tanks with plants or with large fish. 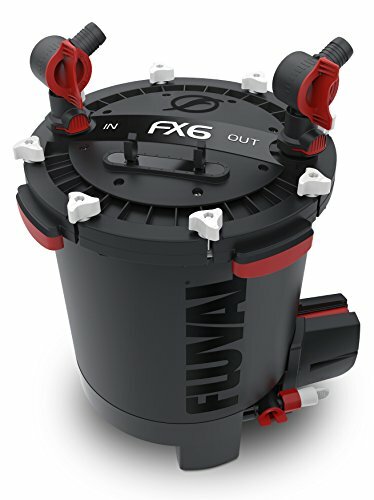 Fluval FX 6 also offers a “Smart Pump” technology which ensures the filter maximum output. The filter has an electronic circuit that continuously controls its operation. Impeller spin speed and rolling force are measured continuously to ensure the filter output and efficiency. The circuit also provides the filter autorun and removes the air which can accumulate inside the system. Once in 12 hours the pump stops and lets the accumulated air out of the system ensuring by this the filtration efficiency at any moment of time. 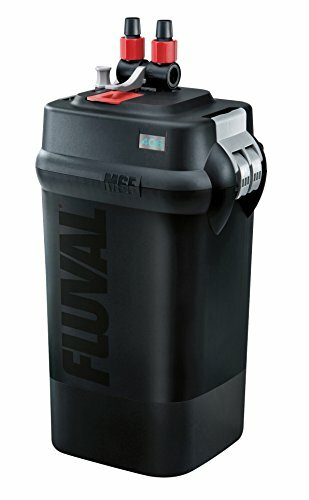 All new product produced by the company in 2016 is Fluval FX4 external canister filter which has some improvements comparing to the previous model. Hagen has made a new highly-efficient filter Fluval FX4 for both marine and freshwater tanks up to 250 Gal. This canister filter has 5 stages of water purification; filter capacity is 30 Wt, filter circulation is (450 US Gal) per hour. Unlike its precessor FX4 has become more compact sized and it doesn’t take much space now. A new smart-pump has been designed for Fluval FX4, which provides the filter maximum output. The pump has a special electric circuit inside which completely controls its operation. It controls the pump power and rotor speed thus it ensures filter maximum output and power consumption efficiency. All filtering details were thoughtfully chosen. The filter consists of 4 containers with total filtration volume (14L or 3/7 US Gal) and biological volume 3.9 L (1 US Gal). Filter baskets come in order in such a way that it provides maximum efficiency and crystal clear water in a tank. Filtering medium and fillers are put in several layers so the water when coming through the filter gets maximally clean from dirt, garbage and harmful microorganisms. The baskets with fillers have subsidiary filtering sponge on the edges which performs additional mechanical water purification. Each basket is responsible for efficient water filtration; foam performs mechanical, preliminary water purification by capturing the smallest garbage particles. 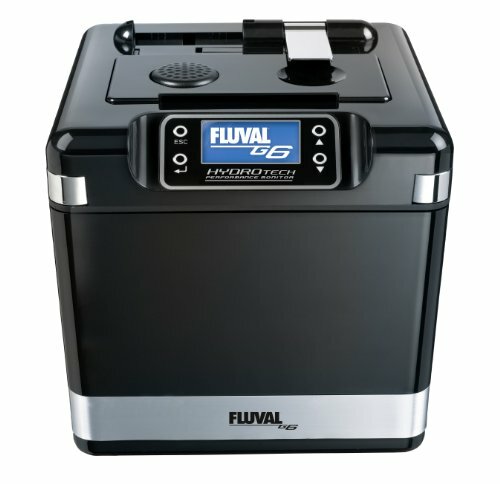 Fluval FX4 filter has a special handler by means of which you can take out and separate all baskets easy and fast. Such an improvement was designed to simplify maximally the filter maintenance. Now you don’t have to waste time disassembling the filter completely to wash the fillers. There is an indicator on top of the filter which helps you to remember the date of the last maintenance. These filters can be used in any tank, they are plain and sustainable. If you don’t want to get into details and just to buy a filter and turn it on, this is the one you need. Its drawbacks are that it comes short of filtration rate and some other abilities when comparing to more modern models and you’ll have to buy filtration media for it. Eheim Company has been producing filters and tank equipment for many years already. The company manufactures sustainable, maintenance-friendly and efficient products. This is proved by company’s 50 years experience of filtration systems creation as well as by many years experience of their utilization by aquarists. For the majority of aquarists Eheim means quality and security. Multi-function models: Eheim 2217 (US gal/h: 264 gph; power consumption 20w) and Eheim 2215 (US gal/h: 164; power consumption W: 15). Despite the fact that «Classic» filters product line has been on the market since 80s it has filters justly called a “willing horse”, some of them have been used for almost 20 years. One may say that these were classic filter models - Eheim 2215 and Eheim 2217 that made Eheim its good name. EHEIM Classic, sold at Amazon.com, is equipped with filter media (EHEIM Mech & Substrat Pro). Here is the filter with the simplest design. It can be considered as a straight pipe filled with filter media. Filter media in this filter type can be placed both directly in its canister and is a special cassette made for it. When installing the cassette you should push it down harsh but slightly till it is fixed in its lowermost position. This ensures reliable pressurization between the cassette and the filter case; it excludes ingress of not filtered water back to the tank as well. Here is the third product line of filters Fluval 106, 206, 306 and 406 they are for those, who want just a simple filter without any frills. Fluval 406 Flow Rate: 1450 L/H (383 US GPH) – this is a legendary improved external canister filter of the 6th generation from Hagen. This filter is for optimal water filtering in freshwater or marine tanks up to 400 Liters (100 U.S. gallons). Flow Rate: 1450 L/H (383 US GPH). The filter provides 3 stage full biological, mechanical and chemical water purification. Fluval G6 will do for those who are keen on technologies, for whom their filter appearance is an important part of interior environment and also for those, who love marine aquariums. This is an innovative, highly-efficient and quiet external filter of G-series, which ensures three stage filtration of tank water and this is an ideal choice for marine and freshwater tanks. It was stated that despite the small output the filter can easily deal with a tank up to 600 liters, however in the real life you should halve this number. The filter rate is 265 gallons per hour. The main innovation in Fluval G6 filter – is «Hydrotech Performance Monitor» module – a set of sensors that measure temperature, flow rate and conductivity. As well as a processor unit with display that ensures both managing data of current measurements and then gather data and output it onto interactive LCD-display. Fluval G6 monitor allows controlling temperature, water flow rate and conductivity, and it displays all these parameters as numbers and graphs. The filter software continuously monitors the filter functioning and in case of emergency displays the warning message ALERT. The filter monitoring system also reminds its owner to the perform maintenance service when it is necessary. Servicing schedule (displays information about the necessity of filter maintenance (to replace its cartridge)). Water conductivity chart (shows conductivity fluctuations and informs about tank water chemical composition change). Temperature chart (displays tank water temperature changes). Alert information display (indicates when the parameters differ from the given ones). Hydor company (the Italian one, not Chinese) has entered external tank filters market relatively recently. It had Hydor prime products line and now Professional model has come to substitute it. 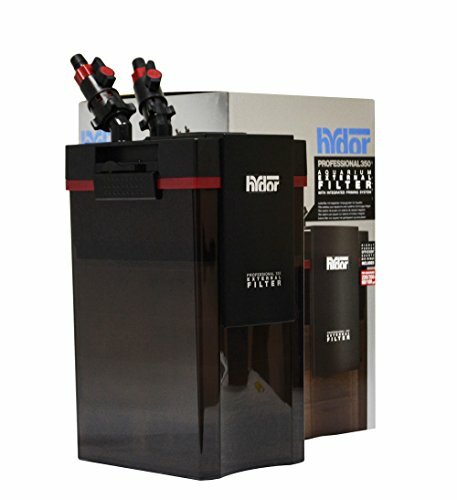 The new product line called Hydor Professional External Filter consists of 5 models (for tanks from 20 to 150 gallons); they have different pump output which allows choosing a model required just for your tank. 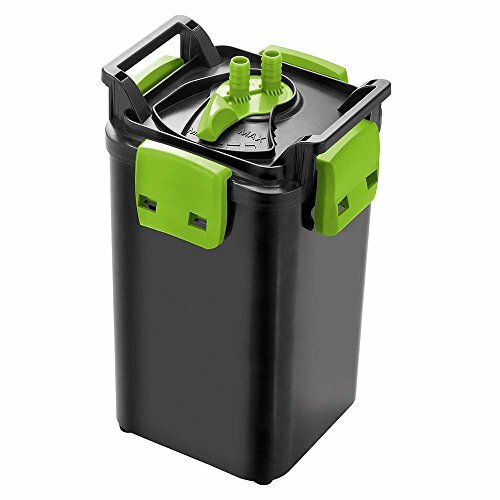 Canister of Hydor Professional external filter is made of sturdy plastic, it has rectangular cross-section which lets you easily put it in the corner of your tank stand. The canister clamps have a system that prevents their self-opening and thus ensures leakproofness and reliability of the tank filter. All filter media and fillers come in the filter set. Each component is in separate basket which allows taking out each of them easily from the filter canister to wash or replace. Tight baskets arrangement in the filter canister provides good water flow directly through the filter media, which prevents clean and dirty water mixing inside the filter. AquaTop company (China) produces one of the simplest and cheapest filters among all of the presented models. The company has rather wide product line, but all filters have common characteristics and list of equipment. These filters are in great demand, since quite often price plays a crucial part. But are they really as cheap as they seem? Let’s find out. For example, let’s consider AquaTop Forza with embedded UV-sterilizer for tanks up to 175 gallons and pump output 550 gph. UV-sterilizer power capacity is 13 W and it provides crystal clear tank water preventing appearance of green algae, different microorganisms and pathogenic bacteria in a tank. So, you can turn of your UV lamp. The filter has high quality ceramic axel to ensure its noiseless operation. There are 4 baskets for different filter media – biological, mechanical and chemical one. UV plus expendables.... However, in fact all of them are of rather low quality and their amount isn’t enough for the filter to function efficiently. Suitable for tanks ranging from 125-175 gal. Until recently these filters were produced by another company and they were quite good. Now it has been bought by API and the production has been transferred to China. API Company (USA) has been on tank equipment market for over 50 years already and it has a good name. But are its canister filters good, especially if before they were produced by Rena? Since the time when Rena was bought out by API some rebranding has been introduced. How did it influence the filters? Let’s see. 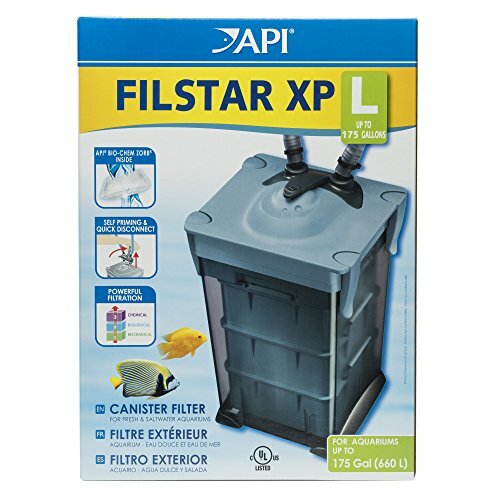 The company has a product line API FilStar XP. Here after XP the model is indicated according to its output. For example, XP 4 filter. One of the most popular models in this line is Rena filstar XP-L (former Rena filstar XP 3). This is an external canister filter for tanks up to 175 US Gal, output 350 US GPH, power consumption 19 watts. Unfortunately, this model has got negative reviews at Amazon.com. First of all the buyers complain about low quality of plastic and leakages. Two years warranty is good, but if you use the warranty coverage several times it’s annoying. IMHO I’d be very careful when choosing this filter and I’d rather wait for the company’s response to the complaints. Possibly it’s connected with the fact that after the company was sold the facilities and production have been transferred to China with the expected results. 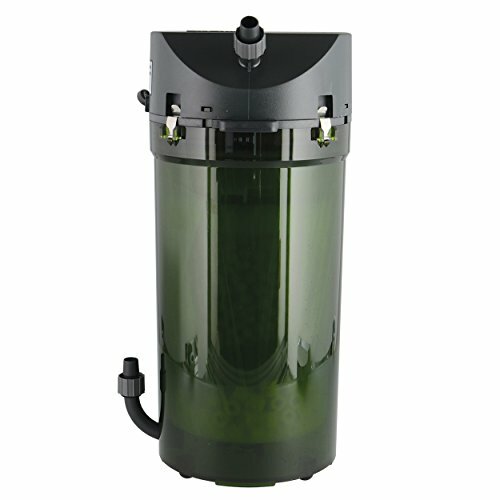 Provides very powerful filtration for crystal clear water and healthy environment. Conventional market of canister filters changes quite seldom and new models appear there rather rarely. Chinese brands make the only exception in this respect, but I’m not sure if we can actually call them new since even their brands are very much alike. So, Aqueon QuietFlow is a true new model. Though it has a few reviews, it seems to have good prospects. It doesn’t have an adaptor like other models. To open the filter you have to shut off two taps on hoses in front of the filter input, release the hoses and take of the cap. The taps are of rather high quality, they don’t leak and they are rationally placed, so when releasing them water doesn’t spill from them. Three baskets with filter materials contain carbon, coarse foam, bio balls and bio-ceramic rings. Small number of baskets is offset by their size; each basket is quite large and contains large number of filter materials. A new and unusual approach was used when designing this filter – it has HOB polisher, which is installed on the back side of the tank. It contains an additional carbon filter for chemical purification of the tank water. When its cartridge becomes dirty, it can be easily replaced. Priming can be a bit difficult to figure out at first, the easiest way is to use the HOB polishing unit, and just pour water into it until it's full. It’s a simple, reliable and use-proved filter. Penn-Plax Company is a popular American manufacturer of cheap goods for aquariums. Filters produced by Penn-Plax are manufactured in China, however they are rather good quality ones. Penn Plax Cascade product line is represented by canister filters for marine and freshwater tanks from 30 US gallons to 200 US gallons. Thus Penn Plax Cascade 1000 canister filter is for aquariums up to 100 gallons and pumps 265 gallons per hour (GPH). There are two trays with foam in each one and also charcoal in one and course filter media in the other. The filter is equipped with a spray bar. Penn-Plax Company was established in 1960 and it has been producing equipment for aquarium husbandry, terrariophilia and other pets for over 50 years already. The filter is good for those who don’t have the ability to put a filter under a tank. This filter’s feature is that it doesn’t need priming and it can be put below, next to and even above the tank! Since it just doesn’t have a pump in its head, the pump is put into the tank together with the intake pipe. This allows switching of the filter and washing it without turning the pump off. I.e. you turn the latch handle, take away the canister and the pump continues working. 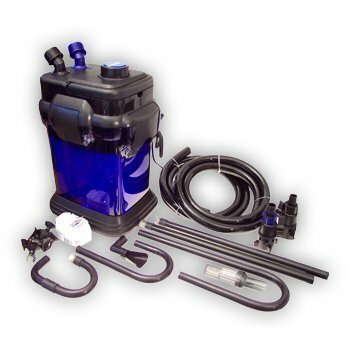 Max flow rate is 210 gph (800l), the filter is for tanks up to 55 gallons, total canister volume is 1.85 gals. No priming; does not need gravity. Can sit below, beside or above your tank. The filter box is designed to have little or no bypass. No spray bar. This type of filter system generally works better with spray bar to help break surface tension and provide the water with oxygen exchange. Without something in an aquarium to provide this function the fish will suffocate and die. The intake screen doesn't fit any of the tubing adapters and will barely stay connected to the pump. For internal pump configurations the screen needs something to affix it to the pump. For external pump configurations you are pretty much screwed. How to find optimal canister filter? I assume you’re quite busy guys and you don’t have time to read all of this and enter into all the details. There is a rather wide range of external filter brands and there are much more filter models on the market. What is confusing that famous and old brands have a lot of different filter models – easy in care and cheap ones, expensive and sophisticated ones. 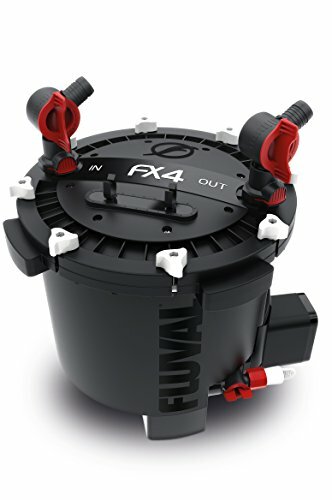 If you want to buy a filter for your tank and you see one or three models provided by the brand, it means that the company isn’t focused on filter production or maybe it has just entered the marked. In my opinion company’s specialization is important since it is a determinative factor and those who produce lots of stuff in small amounts loose to those who are focused on production of just one product. So what is it exactly – biological, mechanical and chemical filtration? Biological filtration, i.e byproducts transformation in a tank. This involves deactivation of ammonia and ammonium which are toxic for tank inhabitants and transferring them into less harmful nitrates that in turn are partially recycled by tank plants and partially removed when performing water renews. Biofiltration is performed by nitrifying bacteria that inhabit in a filter. Technically speaking any filter is more or less occupied by nitrifying bacteria and it can be called a biological one. The thing is that biofiltration is just more efficient in filters of larger volume than in smaller ones. Mechanical filtration or cleaning the water of organic or inorganic suspended matter. Many people consider that this is the main purpose of any filter. Of course it’s not very nice to see muddy tank water. However, the main operating result of a filter is still an efficient biofiltration, not just cleaning tank water of suspended matter and mud. In case of well arranged biofiltration process the tank water is crystal clear. Chemical filtration is based on filter medium and tank water interaction that changes the water properties or content of some matters in the water. Ionite, zeolite and other substances are used as a filter medium. Adsorbtion of some substances (for example some medicines after the treatment was finished) this is when carbon is used. The larger is a ratio of filter media to a tank volume the more efficient filtration is. It’s rather difficult to put a large filter in a tank, since it’ll take additional effective volume. Such internal filters are the best for small or sparsely populated tanks. In the rest of cases an external filter should be chosen.